This tutorial caught our eyes here at Silly Farm. Our New Zealand fans might recognize some of the work from Daizy Design. This appropriately named design, Autumn Eyes, comes at the right time for everyone in the norther hemisphere. Halloween is around the corner and Thanksgiving will soon be following. Time to practice those fall designs! Did I mention that the painter responsible for this tutorial, Christy, is a new FaBAIC 2013 instructor? Christy, AKA Daizy, has been making tutorials on the reg. You can check out her youtube for more face painting tutorials, and give her facebook page a like while you’re at it. 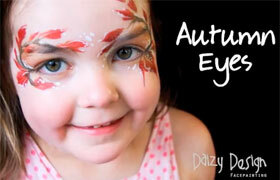 This entry was posted in Videos & Tutorials and tagged Autumn, Daizy Design, Design, Face Painting, Fall, Leaves, Tutorial, video. Bookmark the permalink.